Uterine fibroids, Myomectomy, Hysterectomy, Depression, Anxiety, Interleukin-6. Uterine fibroids are common benign tumors, and an increased incidence in women with age. It would be suggested for surgery when uterine fibroids were symptomatic as oral medication did not work . Despite the generally benign nature, uterine fibroids often lead to hysterectomy . Hysterectomy might have side-effect on women to the extent that need a long time for the patients to follow up examination . While the effect of surgery on psychological state and the prognosis is not well known. Some studies reminded that psychological state was related to prognosis by lots of procedure . Therefore, in the multicenter study we used a randomized, controlled trial to explain the relationship among surgery procedure, psychological state and post-operative stress. The objective of this study was to discuss a better therapy in the hope of improving quality of life and uterine outcomes in these patients. This study took place in the Department of Obstetrics and Gynecology, Zhengzhou People's Hospital. A total of 312 women with uterine fibroids consented to take part in the study, the study was completed between August 2011 and June 2014. It was approved by the Ethics Committee at Zhengzhou People's Hospital. Written informed consent was obtained from each patient before treatment procedure. Inclusion criteria: The patients took part in the study were with symptomatic uterine fibroids and required surgery and age between 25 and 55. The diameter of uterine fibroids were less than 10 cm, the number of uterine fibroids were less than 15. There were 74 patients underwent laparoscopy myomectomy (38.556 ± 6.152 y age), 88 patients underwent abdominal myomectomy (39.126 ± 9.202 y age), 74 underwent laparoscopy hysterectomy (37.423 ± 5.069 y age), 76 patients underwent abdominal hysterectomy (40.398 ± 8.482 y age). 294 cases completed the questionnaires (73 of laparoscopy myomectomy group, 79 of abdominal myomectomy group, 71 of laparoscopy hysterectomy group, and 71 of abdominal hysterectomy group). All general state of the patients was no statistical difference. Subjects completed patients’ QOL assessed with the World Health Organization Quality of Life-BREF questionnaire (WHOQOL-BREF) and a battery of self-assessment scales at pre-surgical procedure, 1 and 3 months after treatment procedure. The self-assessment scales included the Hamilton Anxiety Scale (HAMA) , Self-Rating Anxiety Scale (SAS)  and Self-Rating Depression Scale (SDS) . The assessments pre-operatively were evaluated by face-to-face interviews at administration, and the assessments post-surgery was evaluated by telephone interviews or face-to-face interviews at administration. The serum of patients was collected at pre-surgical procedure, 0 h, 24 h and 72 h after treatment procedure to assess presurgical and postsurgical level of IL6. IL6 was assayed by twosite sandwich Enzyme-Linked Immunosorbent Assay (ELISA) (ELISA kits from Beyotime Institute of Biotechnology). Polystyrene microliter plates were coated with 2-4 μg/ml γ- globulin in coating buffer overnight at 4°C, then washing with PBS-Tween the plates were loaded with the test samples, 200 μg/well, followed immediately by enzyme-labelled γ-globulin, 50 μg/well, to give a final dilution of the labeled γ-globulin of 1/500. Sample and conjugate were thoroughly mixed and incubated in the plates overnight at 4°C. Samples were incubated for 60 min at 37°C in 96-well microliter plates, coated overnight at 4°C with mouse anti-IL6 mAb (1 μg/ml) (anti-IL6 mAb from abcam, ab46027), and saturated for 90 min at 20°C with PBS 5% BSA. After washing, a biotinylated mouse anti-IL6 mAb (1 μg/ml) was added and incubated for 90 min at 20°C. After subsequent incubation with peroxidasecoupled streptavidin and revelation with orthophenylenediamine, the plates were read at 492 nm. Analyses were conducted by SPSS19.0.2. All tests were twotailed. Statistical significance was defined as p-value<0.05. t-test statistics were calculated to compare two groups on baseline clinical and demographical variables. Baseline variables that differed significantly between groups were entered in post-hoc models as covariates. A final set of posthoc analyses were performed with pre-treatment use and treatment use. Data were controlled by pre-treatment and after operation methods, to further examine the relationship between total score of self-assessment scales and IL6. The study took one year to investigate the patients with uterine fibroids underwent surgery. There are 293 patients completed the study. It revealed that the level of IL6 was no significant compared the laparoscopy group to the laparotomy group before surgical procedure (P>0.01), the level of IL6 was no significant compared the myomectomy group to the hysterectomy group before surgical procedure either (P>0.01). While after the surgical procedure the level of IL6 was significant different compared the laparoscopy group to the laparotomy group (P<0.01), the level of IL6 was significant different compared the laparoscopy myomectomy group to the laparoscopy hysterectomy group either (P<0.01) (Table 1). Bivariate Pearson’s correlation analysis revealed the level of IL6 in each group showed progressive decline after surgical procedure in statistically. It was observed that the level of IL6 in patients by laparotomy had more flexible than that by laparoscopy after surgical procedure (P<0.01) (Figure 1). Table 1: The level of IL6 compared with each group. Figure 1: The trend of IL6 in each group. There was no significant trend toward higher depressive symptoms and anxiety symptoms in any group. Results of ttests showed that compared with patients by laparotomy, the patients underwent laparoscopy showed significant improvement on psychological state. It was observed that patients by laparoscopy had more serious depression symptoms than that by laparotomy before surgical procedure (P<0.01). ttest analysis revealed that the scores of SAS/SDS was significant different compared the myomectomy group to the hysterectomy group either by laparotomy or laparoscopy before surgical procedure (P<0.01), after surgery the scores of SAS/SDS was significant different either (P<0.01). Bivariate Pearson’s correlation analysis revealed that the scores of SAS/SDS were progressive decline of the patients by laparoscopy. However, it did not show significantly variability on SAS/SDS scores of the patients by laparotomy. Compared with SAS/SDS, the scores of HAMA showed irregular differences between the laparoscopy myomectomy group and the laparoscopy hysterectomy group. It was observed that the scores of HAMA was significant different compared the laparoscopy myomectomy group to the laparotomy hysterectomy group one month after surgery (P<0.01) (Table 2). Bivariate Pearson’s correlation analysis revealed that the scores of HAMA was progressive decline of the patients by laparoscopy (P<0.01), while the scores of HAMA was first rise then fall in the laparotomy group one month after surgery (P<0.01) (Figure 2). Table 2: Psychological scores compared with each group. Figure 2: Shows the distribution of SPIO1-m0 inside macrophages. Bivariate Pearson’s correlation revealed significant positive relationships between IL6 and SAS/SDS score, especially in the laparoscopy myomectomy group. No significant correlations emerged for IL6 and HAMA score in any group. Compared with WHOQOL-BREF, no severe operative complication occurred in each groups. The scores of each domain improved in the laparoscopy and laparotomy group. 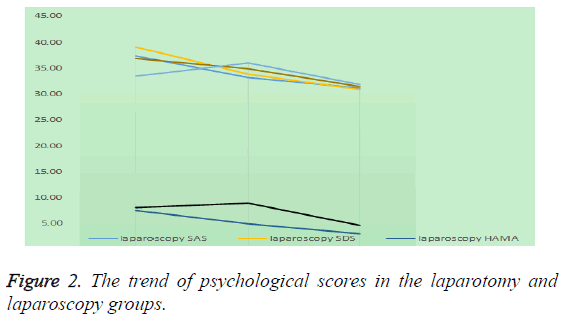 In the physical health domain (D1), the psychological domain (D2) and the social relationships domain (D3), it was observed that the scores were significant different between the laparoscopy group and the laparotomy group (P<0.01). Bivariate Pearson’s correlation analysis revealed that the scores of D2 was progressive improved of the patients by laparoscopy (P<0.01) (Table 3). Table 3: Quality of life change scores compared with each group. As more treatment procedures were assessed for uterine fibroids, more attention on patients’ psychological state and prognosis . Depression and anxiety are the most common psychiatric disorders in women , but they may not be easily recognized in women with uterine fibroids as some symptoms are difficult to distinguish from the effects of uterine fibroids, such as fatigue, asthenia and lethargy. Poor recognition of depressive and anxiety disorders in these patients can lead to a perceived worsening of symptoms . It previously reported that inflammatory cytokines have effects of psychiatric disorders . The publication of two meta-analyses underscored that depression was associated with signs of inflammation. In addition, depression and anxiety may be the side effects of surgical treatment. In this study we determined the correlation of stress and psychological state in the different treatments of patients with uterine fibroid. IL6, as one representative factor of stress response , took important part in immune regulation either . In this study the level of IL6 presented a high level the time after surgery but downward in a period after surgery as many studies had demonstrated . It was associated with less stress and minimally invasive surgery that IL6 reduced faster in the laparoscopy myomectomy group. We found a statistically significant improvement in psychological state and serum level of IL6 is closer to the normal level before surgeries compared the laparoscopy group to the laparotomy group. While the patients who had higher level of IL6 emerged worse psychological state within three months after surgery. IL6 showed a predicted marker for postoperative state in this study. It may be that stress is neuroendocrine response caused by Hypothalamic Pituitary- Adrenal axis (HPA) secretion, IL6 would easily affected by the unstable psychological factors of individuals and present a higher level to other individuals, and those patients who had unstable psychological factors were more prone to psychological problems such as depression and anxiety . Mean depression and anxiety scores were higher in patients with surgeries than that in healthy control populations as many studies have proved . In this study it did not find serious depression or anxiety patients before or after surgeries, while mild depression and mild anxiety symptoms were found in the laparoscopy group pre-surgical procedure and the laparotomy group pro-surgical procedure. As many studies have proved, surgery is a major stress factor and has significant effect on psychological state of patients . While in this study, the symptom of depression and anxiety before laparoscopy has a certain relationship with preoperative communication. Postoperative improvements in depression scores after effective treatment have also been observed in the past , and the better performance of psychological state after surgery in the laparoscopy group was associated with the less trauma, quicker recovery, shorter hospital stay of minimally invasive surgery. In contrast to those previous prospective studies, we hypothesized that individuals who had more depressive symptoms would have greater increased IL6 in response to the stress than those with fewer depressive symptoms. In this study it was found that the laparoscopy group compared with the laparotomy group has slightly worse psychological state before surgery but greater improvement after surgery. It suggested that patients need appropriate mental nursing before each treatment procedure, and the preoperative measure would be efficacious on the restoration, the psychological effect IL6 could be considered, prompt a better accurate therapy. In the world, there are so many surgical procedure for the patients with uterine fibroids to avoid suffering , laparotomy and laparoscopy are no longer to meet the contemporary needs, less trauma, quicker recovery, shorter hospital stay are all the eternal pursuit of all surgeries . High Intensity Focused Ultrasound (HIFU) was born in the era of ever-changing technology. HIFU is a novel modality pioneered for the treatment of uterine fibroids . Unlike previous alternatives to uterine fibroids, HIFU does not require insertion of an endoscope, catheter, or needle into the body . The energy from multiple elements of the phased array transducer passes through the anterior abdominal wall and causes coagulative necrosis only at the focal volume where the ultrasound waves converge . In contrast to laparoscopy, maybe the non-invasive make patients feel secure and like to have a chance to try. In the future, we would make a further research on the intervention of mental for the patients need HIFU and other surgeries to find a better safe and effective method. Donnez J, Donnez O, Matule D. Long-term medical management of uterine fibroids with ulipristal acetate. Fertil Steril 2016; 105: 165-173. Jacoby VL, Jacoby A, Learman LA. Use of medical, surgical and complementary treatments among women with fibroids. Eur J Obstetr Gynecol Reprod Biol 2014; 182: 220-225. Emanuel MH. Hysteroscopy and the treatment of uterine fibroids. Best Pract Res Clin Obstetr Gynaecol 2015; 29: 920-929. Wang HL, Booth-Laforce C, Tang SM, Wu WR, Chen CH. Depressive symptoms in Taiwanese women during the peri- and post-menopause years: Associations with demographic, health, and psychosocial characteristics. Maturitas 2013; 75: 355-360. Mula M, Iudice A, La Neve A. Validation of the Hamilton Rating Scale for Depression in adults with epilepsy. Epilepsy Behav 2014; 41: 122-125. Zung WWK. A rating instrument for anxiety disorders. Psychosomatics 1971; 12: 371-379. Brown GL, Zung WWK. Depression scales: self- or physician-rating? A validation of certain clinically observable phenomena. Compr Psych 1972; 13: 361-367. Merrell J, Lavery M, Ashton K, Heinberg L. Depression and infertility in women seeking bariatric surgery. Surg Obes Relat Dis 2014; 10: 132-137. Groer MW, Morgan K. Immune, health and endocrine characteristics of depressed postpartum mothers. Psychoneuroendocrinol 2007; 32: 133-139. Aniszewska A, Chłodzinska N, Bartkowska K, Winnicka MM, Turlejski K, Djavadian RL. The expression of interleukin-6 and its receptor in various brain regions and their roles in exploratory behavior and stress responses. J Neuroimmunol 2015; 284: 1-9. Pellissier S, Dantzer C, Mondillon L. Uncoupling between the vagal tone and HPA axis in patients with Crohns disease or irritable bowel syndrome: Relation to stress and inflammation. Autonom Neurosci 2013; 177: 315-316. Bauld R, Brown R. Stress, psychological distress, psychosocial factors, menopause symptoms and physical health in women. Maturitas 2009; 62: 160-165. Dich N, Doan SN, Kivimäki M, Kumari M, Rod NH. A non-linear association between self-reported negative emotional response to stress and subsequent allostatic load: Prospective results from the Whitehall II cohort study. Psychoneuroendocrinol 2014; 49: 54-61. Cho CH, Seo HJ, Bae KC, Lee KJ, Hwang I, Warner JJP. The impact of depression and anxiety on self-assessed pain, disability, and quality of life in patients scheduled for rotator cuff repair. J Shoulder Elbow Surg 2013; 22: 1160-1166. Ellington DR, Erekson EA, Richter HE. Outcomes of Surgery for Stress Urinary Incontinence in the Older Woman. Clin Geriatr Med 2015; 31: 487-505. Ho SY, Rohan KJ, Parent J, Tager FA, McKinley PS. A longitudinal study of depression, fatigue, and sleep disturbances as a symptom cluster in women with breast cancer. J Pain Symptom Manage 2015; 49: 707-715. Martín-Merino E, García Rodríguez LA, Wallander M-A, Andersson S, Soriano-Gabarró M. The incidence of hysterectomy, uterus-preserving procedures and recurrent treatment in the management of uterine fibroids. Eur J Obstetr Gynecol Reprod Biol 2015; 194: 147-152. Peng S, Hu L, Chen W. Intraprocedure contrast enhanced ultrasound: The value in assessing the effect of ultrasound-guided high intensity focused ultrasound ablation for uterine fibroids. Ultrasonics 2015; 58: 123-128. Chen J, Chen W, Zhang L. Safety of ultrasound-guided ultrasound ablation for uterine fibroids and adenomyosis: A review of 9988 cases. Ultrasonics Sonochem 2015; 27: 671-676. Quinn SD, Vedelago J, Gedroyc W, Regan L. Safety and five-year re-intervention following magnetic resonance-guided focused ultrasound (MRgFUS) for uterine fibroids. Eur J Obstetr Gynecol Reprod Biol 2014; 182: 247-251.